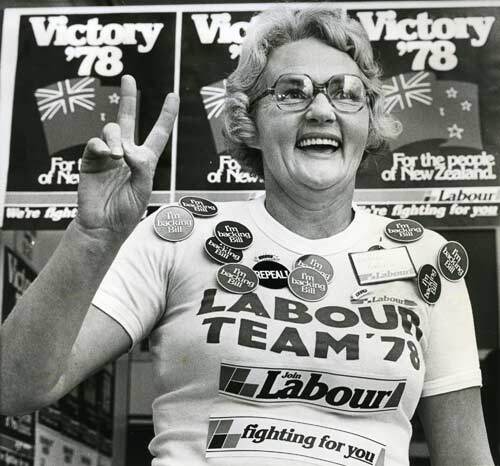 Barbara Forsyth of Pakuranga, Auckland, is shown in the 'victory shop' at Labour's 1978 annual conference in the Wellington Town Hall. Forsyth was then the party's Pakuranga branch secretary and founder of its women's branch. She was also founding secretary of the Auckland Labour Women's Committee. Staunch Labour supporters such as Forsyth could buy election campaign material such as posters, buttons and ballpoint pens to raise funds for election campaigns and other party expenses. Labour lost the 1978 general election, despite winning a larger share of the vote than its National Party opponents under the 'first past the post' electoral system, which New Zealand had until the introduction of proportional representation in 1996.